It is entirely possible to have a society where electors demand that aspiring politicians and candidates bring social justice policies, grounded in human rights foundations, to our Federal Parliament on behalf of the electorate. It actually used to be "normal" to demand they work on this platform! Is it possible to demand social justice accountability from our politicians? Is it possible to demand this in a context where politicians are winning elections based on ramping up the Fear of the Other, the fear of Muslims and people from the Middle East, fear of Trade Unions, fear of refugees and asylum seekers asking for our help and coming to our shores? Admission Fees: "by generous donation"
Consumables: Drinks - "by generous donation"
Sponsors: City of Fremantle, The Fremantle Herald, Kulcha Multicultural Arts of WA; indemnity insurance provided by the Greens of WA. Human geographer Dr Nancy Hudson-Rodd is honorary research associate, Centre of Social Research, Edith Cowan University. 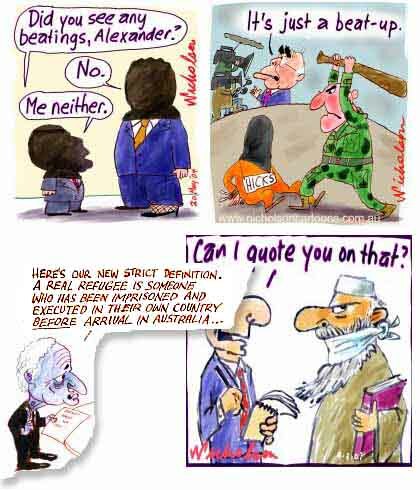 In 2005 she curated The Coalition of the Unwilling: Cartoonists Against War, an exhibition of political cartoons by Steve Bell (The Guardian, London), Michael Leunig and Bruce Petty (The Age, Melbourne) and co-edited, major Indian author and political cartoonist's Tragic Idiom: O.V Vijayan's Cartoons & Notes on India (2006). Nancy has taught and researched in areas of human rights and international development with special focus on Southeast Asia during her 8 years as Senior Lecturer, in the School of International, Cultural and Community Studies and 3 years as head of the Centre for Development Studies, Edith Cowan University. She has conducted research on and in Burma for the past decade on life under military occupation, land confiscation and forced labour. Nancy was President of the United Nations Association of Australia WA 2003-04. Below is the list of candidates for the Federal electorate of Fremantle, as well as the list of lead Senate Candidates for Western Australia. All candidates have been invited, or all attempts have been made to invite these candidates. Candidates marked with * * have confirmed their attendance, while apologies have been received from candidates marked with (#). The question marks show absence of final confirmation. Gripping, nightmarish, and at times bleakly funny, The Road To Guantánamo is far too important a personal testimony to go unheard. In this compelling docudrama by Michael Winterbottom and Mat Whitecross, the 'Tipton Three' narrate their own experiences in America's controversial offshore detention camp. The Road To Guantánamo opens with archive footage of George W Bush, flanked by a stern-faced Tony Blair, declaring his certain knowledge that all the detainees held in Guantánamo are "bad people". Everything that follows is designed to turn these words inside out, as three young British Muslims tell the story of how they came to be in US custody at Guantánamo for over two years, and discuss the Kafkaesque horrors that awaited them there, until finally they were released without charge or apology. The title may evoke the Bing Crosby and Bob Hope 'Road' movies of the 1940s, travel-themed musical comedies with a vaguely racist depiction of non-Americans, but the exotic journey embarked upon by the so-called 'Tipton Three' was to take them into areas that were politically incorrect in an altogether different way. About to get married in Pakistan, Birmingham lad Asif Iqbal (Usman) invites his friends Ruhal Ahmed (Harun) and Shafiq Rasul (Ahmed) to join him there for a holiday. Accompanied by another friend called Monir (Siddiqui) and Shafiq's cousin Zahid (Iqbal), they head into Afghanistan, hoping to offer humanitarian aid to their fellow Muslims and to see the place for themselves. After several weeks, they realise they've made a terrible mistake and try to head back to Pakistan, instead ending up under heavy bombardment near Kundun. Separated from Monir (who is never seen again), they become captives of the Northern Alliance in the notorious Sheberghan Prison. Once it is discovered that the three friends are English, they are at first relieved to find themselves handed over to American custody; but in fact their nightmare is only just beginning, as they are passed from Kandahar Airbase to Camp X-Ray, from Camp Delta to solitary confinement, facing mistreatment, injustice and endless, pointless interrogations. In The Road To Guantánamo, the misadventures of Asif, Ruhel and Shafiq are vividly reconstructed by actors, while at the same time anchored to reality by the intercutting of extensive interviews with the real trio, as well as occasional barrages of archival news footage. The result is an utterly devastating, gripping portrayal of innocents abroad falling foul of both large-scale international events and a US policy that seems cruel, inhuman and willfully blind, with the three men's testimonies a stark reminder that the awful, often darkly surreal events unfolding on screen actually took place. 'Intelligence' comes out of this film looking almost comically stupid. The interrogators are entirely convinced of their captives' guilt, but seem less sure of (and indeed less interested in) easily verifiable details like who the detainees are, what language they speak, and whether they were actually in England (under well-documented police probation) at the time that the interrogators insist they were meeting Osama bin Laden in Afghanistan. What the three actually have to say is rarely heeded, while manipulative lies, brutalisation, beatings, stress positions, and months of solitary confinement are regularly employed to persuade them of the interrogators' point of view. Of course such abuses will come as little surprise to anyone reading the newspapers, but to see them re-enacted (albeit with a certain restraint), and to hear the victims' personal accounts, has a much greater impact than the written word, putting paid to America's claims that the treatment of so-called 'enemy combatants' is, as Donald Rumsfeld puts it, "humane and appropriate and consistent with the Geneva Convention for the most part." It would be easy to criticise The Road to Guantánamo for being one-sided (it is), and for failing to contextualise the conduct of the US (there is not even a passing mention of 9/11), but such objections miss the point. Many times Bush, Blair and other politicians have used their considerable public platforms to present a similarly partisan, at times even subsequently discredited justification for different aspects of their 'War on Terror', including the unlimited detention without trial of men like the Tipton Three. The trio, and the more than 800 prisoners who remain at America's Cuban base, were not able to communicate their version of events to a lawyer or judge, let alone to the outside world. The Road To Guantánamo gives them their day in court, and the story these "bad people" tell is one that well deserves a hearing.